The 4C (pictured) was styled by Fiat's design center in Turin. 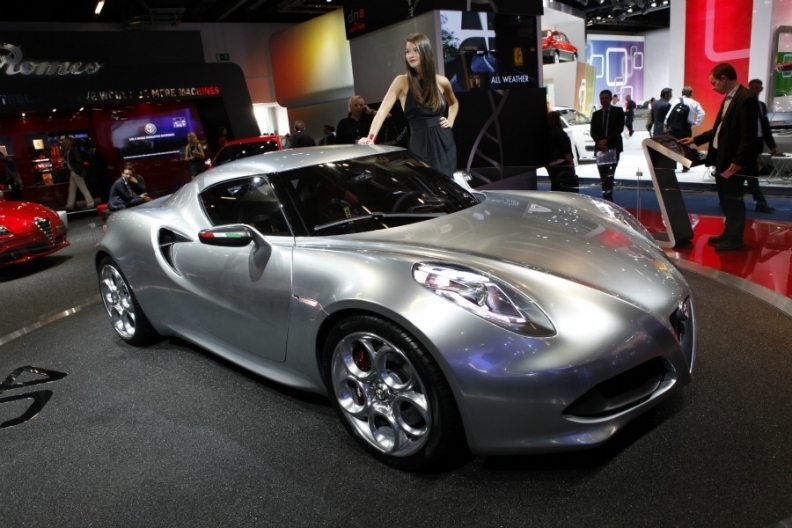 FRANKFURT -- Alfa Romeo will start selling the 4C rear-wheel-drive coupe will in 2013. Up to now, parent company Fiat S.p.A. has revealed few details about the production version of the 4C concept unveiled in March at the Geneva auto show. At the Frankfurt auto show, Alfa exhibited the 4C concept repainted in a metallic silver color it calls fluid metal. The 4C will probably be the first model Alfa will sell in the United States as part of a much-delayed return to the U.S.
Talking to reporters in Frankfurt, Alfa's CEO Harald Wester, said: "Light weight and efficiency, Italian style, advanced technology and vehicle dynamics are the core values that will lead Alfa Romeo in the future. This philosophy continues with the 4C, which represents our greatest advancements to date and is a precursor of future development." Alfa plans to build 15,000 to 20,000 units of the 4C coupe over five years, two people familiar to the matter told Automotive News Europe. Another 5,000 to 10,000 units of a roadster version of the 4C will be built for Abarth, the sources said. Abarth is Fiat's sporty sub brand that markets high-performance versions of the Fiat 500 minicar and Punto subcompact. Alfa is set to price the production 4C at about 45,000 euros in Europe, company sources say. Powered with Fiat's 1.8-liter 4-cylinder direct injection turbo gasoline engine, the 4C concept takes design cues from the legendary 33 Stradale launched in 1967. The Alfa 4C has a top speed of 250kph (155mph) and will accelerate from 0-100kph (62mph) in less than five seconds, Wester said. The 4C concept was styled by the Fiat Group subsidiary's design center in Turin under the direction of Lorenzo Ramaciotti, recently appointed head of design for Fiat and Chrysler Group. The 4C's weight is confirmed at around 850 kg (1,784 pounds), with power topping 200hp and a weight to power ratio less than 4 kg (8.82 pounds)/hp, a value worthy of a real supercar," Alfa said. By comparison, the rear-engine, rear-drive Porsche Cayman coupe offers a 3.98kg (8.77 pounds)/hp weight-to-power ratio even for the S performance model, where 320 hp has to move 1,275kg. The two-seater, rear-wheel drive coupe with central engine is approximately 4000mm (13.12 feet) long, sitting on a 2,400mm (7.87 feet) wheel base..